Create dozens of decorative, homemade cookies quickly and easily. 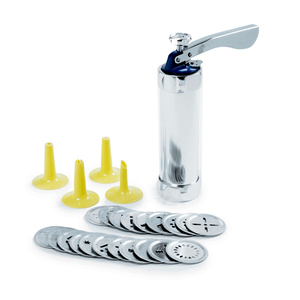 The cookie press includes 20 discs and 4 icing tips. Measures 8.5"/21.5cm. Made of Aluminum. Holds 1.25 cups. Also includes an instruction booklet and recipes to get you started. Hand washing recommended.